An instant-coffee powder with the intense, dark-roast flavor of brewed espresso. This powder is not made up of finely-ground coffee beans; it is a crystalline coffee product, similar to regular instant coffee but with a deeper, richer flavor. Instant espresso dissolves readily in liquid. 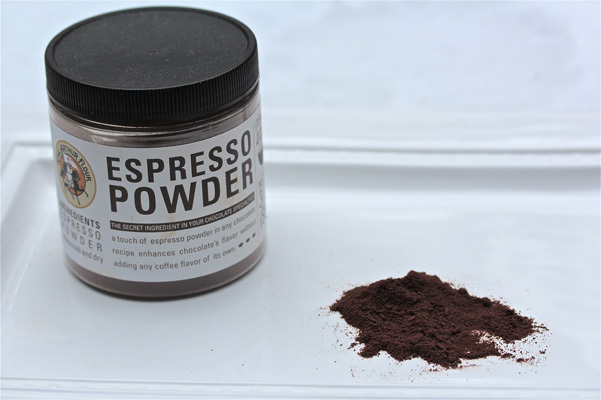 Instant espresso powder can bring coffee flavor to baked goods and desserts where brewed coffee would add too much liquid and not enough flavor. Instant coffee can be substituted, but the flavor will not be as intense or pronounced. Try using 1½ times the amount of instant espresso called for, taste, then adjust. To boost the coffee flavor, try dissolving instant espresso powder in Kahlua or leftover brewed coffee. We use both Medalio d’Oro and King Arthur Flour’s house brand in our Test Kitchen.